Five days. Four nights. Brutal, cutting winds. Collapsed bags and chilled to the bone sleeplessness. Chewed up blistered feet. Icy crust, windblown hardpack, kilometers of sastrugi, falls and frustration. Lots of "why do I do this". On the other hand, more than a fair share of sunshine, long, oh so long, views, long, oh so long, light and landscapes that drop your jaw and take away your ability to speak. Can't wait to go back! In fact, as luck would have it, I am going back. 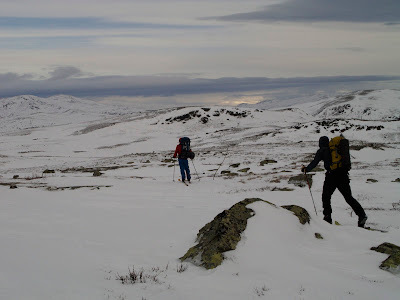 I'm heading North on Saturday morning for a week of lift served skiing in, of all places, Gausdal (I could save myself a lot of money by moving to Norway!). "Tut, tut," I hear you say, "earn your turns". I reckon, after last week, I've got some turns in the bank. Besides, Emily's only three and it'll be a few years before she's dragging her dad off to cold camp in the backcountry. More on the Huldreheimen trip when I get back. Magic. I'm off up north in a couple of weeks. I'm sure there will be equal measures of 'Why do I do this?' and 'Can't wait to go back!' on that trip too. Sound great Dave, can't wait to hear more. Nice one Dave. It's a fantastic country. I wish i could afford to go often. I also wish i could ski. But there we go. Collapsed bags and blistered feet sound horrible! Five days skiing in the North sounds amazing. I also think you should move to Norway, it's the second best country in the world :) And right beside the best country in the world! Joe, Thanks. If I don't catch you before you leave then good luck up North! Roger, It was indeed a great trip. There where a couple of less than great moments on this one but you have to expect to pay some tax now and again I guess. Tomas, Horrible and amazing is right. Thankfully the latter was in far greater measure and compensated the former more than adequately. On the subject of collapsed bags I need to work on my winter skills. I look forward to reading the write up for this.